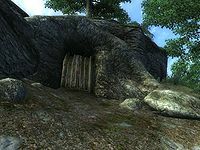 Unmarked Cave is a medium-sized cave between the Imperial City and Bruma containing monsters. 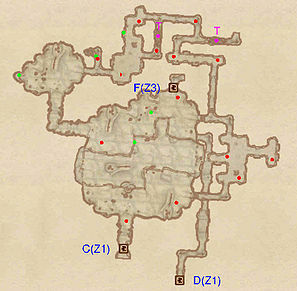 It contains three zones: Unmarked Cave, Unmarked Cave Mazeway, and Unmarked Cave Black Queen's Hall. This cave was apparently intended to be part of a quest that was never completed. One result is that most of the cave is inaccessible without taking advantage of exploits. To the right when you first enter this cave is a locked door that requires a unique key to open, and thus cannot be picked. This door leads to the second section of the cave, Unmarked Cave Mazeway. 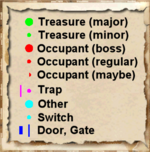 However the key for this door does not actually exist in the game (or even in the game's construction set; see the Talk Page), nor is there any script that unlocks the door. Therefore you can normally only explore part of the first zone. 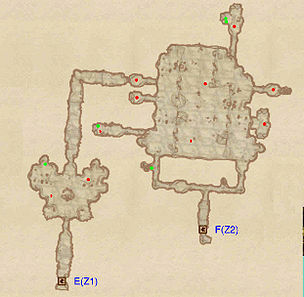 Unmarked Cave Black Queen's Hall contains a chest identified in the construction set as ChestMS25DungeonMythicEnemyRare01. The chest's name demonstrates that it was supposed to be used as part of a miscellaneous quest identified as "MS25". 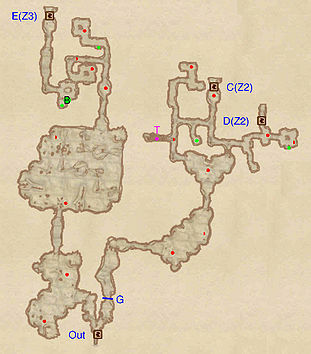 No such quest exists in the distributed version of the game, however, and this is the only reference anywhere to MS25. Despite its interesting name, the chest is completely empty. One other possible clue related to this quest is a "Rumor" dialogue that can be heard in Cheydinhal: "Dervera Romalen is sure proud of the Newlands Lodge. I think she's especially happy that the Red Queen drinks there." This is the only mention anywhere of a "red queen". It is possible that the unfinished quest involved both a red queen and a black queen. The only known way to explore this cave (without using Console commands) is by using an exploit to go through the cave in reverse, starting at the exit. In the northern section of the accessible part of the first zone is a cave with a hole in the ceiling; in a normal cave, this hole would be used to jump down from the upper level and exit after exploring the entire cave. Using the Floating Paint Brushes Cheat or high Acrobatics, it is possible to jump up through this hole. This allows you to explore the Unmarked Black Queen's Hall and beyond. However, even from the other side, it is not possible to unlock the door without using the console. This location's map marker (M on map) is named Unmarked Cave (editor name UnmarkedCave01MapMarker). The entrance door is NNE of the marker, 50 feet away. This zone is split in half by a deep trench of water. If you work through the maze of tunnels, you are able to get around the trench. If you jump in to the water, the only way out is a short underwater tunnel (no Water Breathing needed) that leads back to the first zone. There is one underwater chest in the trench. There is a corridor near the water trench (but not in the same cave room) where rocks tumble down blocking further progress. You can clear rock debris enough to get passed it using a Weak Fireball or Fireball. At the end of the corridor to the left the floor, ceiling and walls end right there, at what seems to be a vast underground lake. If you jump out into it though, you find your self outside of the map. You can look back and see the layout of that level as if you had turned Collision off (using the TCL console command). It may be that there is no key because the quest-line (as well as the map) was never completed before release (or they just didn't bother to build anything after the rock-fall figuring you couldn't get past it). It is possible to get back inside the map by going directly below a door, looking straight up, jumping out of the water, and using the door.